Best Checks is the lowest-cost, fastest-service manufacturer of laser and inkjet computer checks in the industry. Receive your checks in days, not weeks, and save up to 50% compared to other check printers! Our checks are compatible with most major software packages, including Quicken®, QuickBooks®, MYOB®, Peachtree®, Microsoft Money®, Managing Your Money®, Simply Money®, One-Write Plus® and more. We also offer printable deposit tickets, envelopes, and laser taxis, all at the lowest prices. Why Buy From Best Checks? All orders are RUSH. If you're like most customers, you need your checks immediately. Over 97% of our orders are processed within 24 hours. Other printers advertise one to two weeks to print your order. We don't think you should have to wait. The only complaint we've had is that we are too fast. Make sure your order is correct when you fax or mail it in because if you call us with a correction it will probably be too late! Highest Quality. Our technology and equipment are state of the art. There is a difference! The weight of the paper, quality of the printed images, and built-in security features we offer exceed all banking and industry quality standards. Lowest Prices on the Net. We guarantee it! If you find a lower price on the web for comparable quantities and quality, we will match or beat that price; just write it on the order form with the URL of the site. It's easy to order. Fill out the simple order form, attach a voided check, and fax or mail it in. That's all! We'll contact you immediately if we have any questions. Otherwise, your order will print and ship out within 24 hours. Compatibility. We guarantee bank processing and software compatibility. We specialize in a limited number of software formats, and we print them extremely well. We pay attention to the details. Are you a Quicken/QuickBooks user? Don't you hate the way the memo line on the check shows credit card numbers through the window envelope? So do we. That's why we custom manufacture our envelopes to our specifications to make sure the memo line is covered. Security. We are the manufacturer of your checks, so your sensitive banking information never leaves our secure premises. We use the best (and most expensive) security paper in the industry, because it's important to prevent anyone from altering your checks. Guarantee. We guarantee our products to conform to all banking standards and processing requirements. We also guarantee the quality of the checks. If you are not satisfied with the quality, you can return the checks for a complete refund. How Are Our Low Prices Possible? Our prices are so low because we offer a limited selection of check formats, in a limited number of colors, through a mail order service. We offer only laser and inkjet business size computer checks. 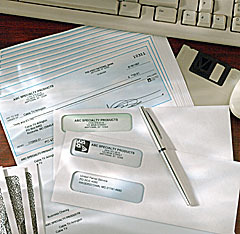 We do not offer personal or checkbook style checks. We do not offer continuous form (tractor feed, or dot matrix) checks. We do not offer wallet size checks. We pass the savings on to you. Our process is totally automated. We developed proprietary software to streamline the production of your order. That's why we can usually ship your order within 24 hours. By eliminating all of the manual steps used by our competitors we save significant labor and material costs. These savings are passed on to you. There is no marketing department. We don't offer 32-page 4-color glossy brochures. Other check printers spend over $20 per order on marketing costs. We limit our costs and pass these savings on to you. We set up this web page and made our order form so simple that ordering is easy! Because our web site has complete information, most customers don't need to call with questions. This keeps our call center costs low, and we pass these savings on to you. Review our check formats, software compatibility, and color options to make sure we support your software package. Check out our prices. You'll be pleasantly surprised. Need more information? Want samples? Request more information.